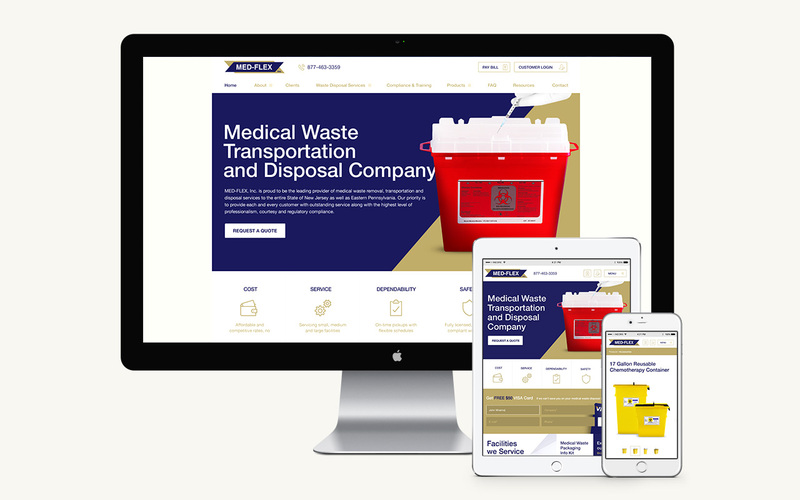 Medical waste transportation and disposal company. 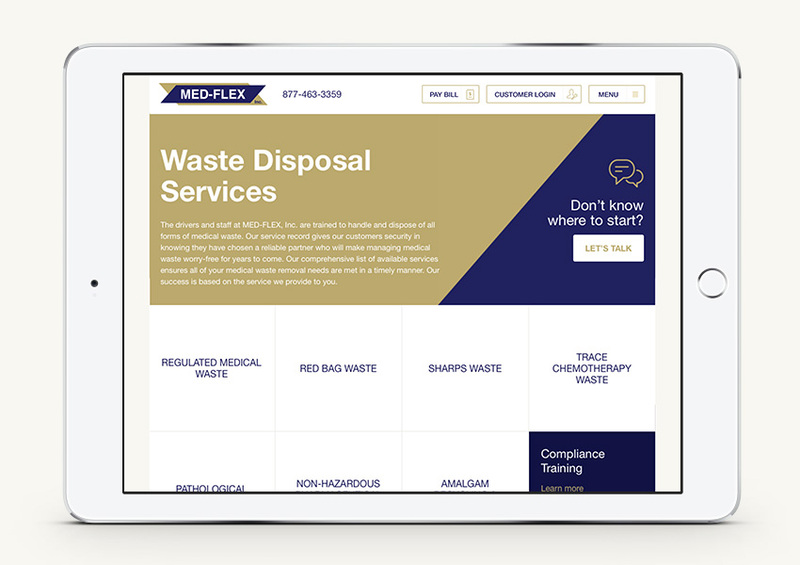 Since 1998, MED-FLEX, Inc. has been providing medical waste removal, transportation, and disposal to clients throughout New Jersey and Eastern Pennsylvania. What began as a humble company now serves more than 3,000 small, medium, and large facilities in the area. Their current product line consists of disposable and reusable sharp containers, medical waste boxes, non-hazardous pharmaceutical waste baskets, and other vital accessories for hospitals and other medical facilities. In addition to protecting clients and their patients, MED-FLEX also ensures that every facility is in compliance with state and federal laws. The company remains flexible in order to continually provide reliable services in the ever-changing medical world. The goal was to create a website that gives an outstanding digital presence, which increases client retention and acquisition. There are no second first impressions, so INCORE had to ensure that the brand is leveraged to establish positive recall with the visitors and potential customers at the first place, without giving them even a slightest chance to question the professionalism of the company. 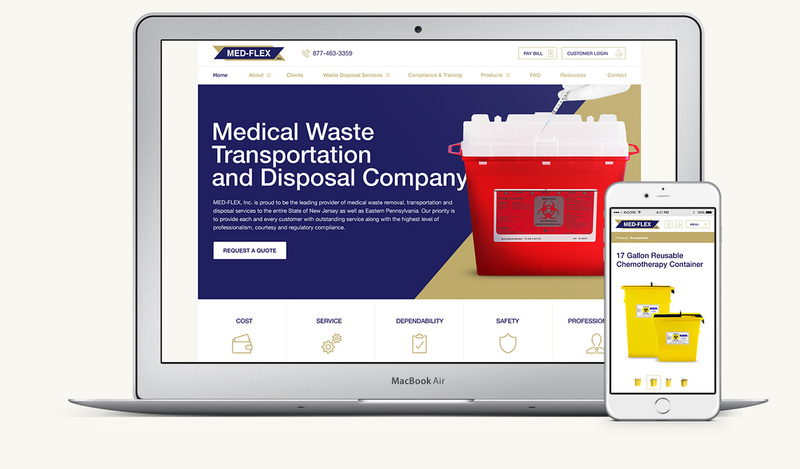 It was important to make the website user friendly, make significant improvements to the UX (user experience) on mobile devices, and make the site look sleeker to give MED-FLEX, Inc. an edge over competitors. the time to learn about target audience, as well as competition in medical waste disposal industry. This intense research process was necessary to build a website that stands out, a website that is user friendly, communicates with the core audience and achieves the desired objectives. Thank to brand new visual design, content structuring and its presentation were improved and the clutter was removed. Analyzing the history data about website visitors helped to determine whether support for mobile devices is advisable. 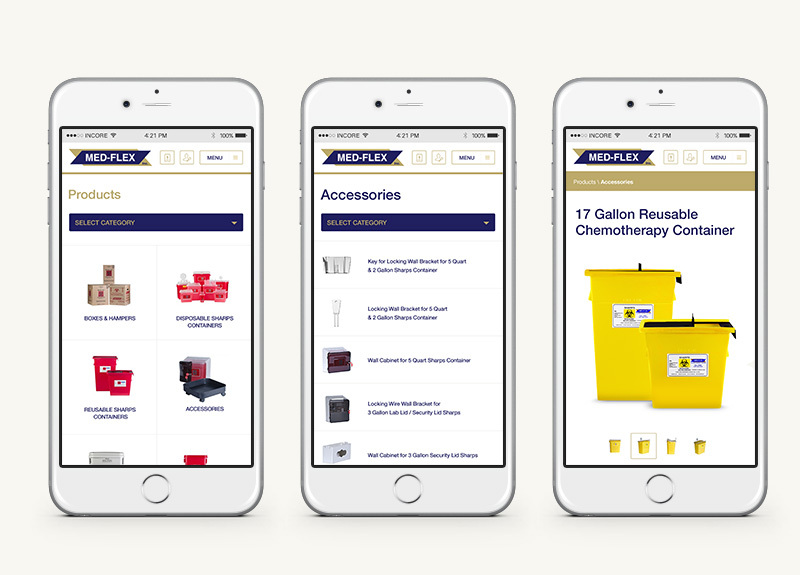 Since many consumers use their mobile devices to find pertinent information, it was beneficial for MED-FLEX to have a strong mobile presence. INCORE utilized Responsive Web Design (RWD) practices to design a website that is friendly for tablets and smart phones. Mobile devices are often constrained by display size and require a totally different approach to how content is laid out and presented to the user. To allow the client to make changes to the website without the need to learn about programming, content management system (CMS) was implemented. The new website is search engine friendly and the most recent SEO practices were incorporated to help MED-FLEX increase exposure in search engines and outrank competition. Last, but not least the website hosting has been stabilized and thank to new, more optimized coding techniques the load times of new website were improved by over 30%. The data migration has been properly planned and executed to make sure there is no traffic loss during transition. The new website is a modern online business presence that achieves objectives, brings results. It is a solid foundation, ready for growth. It is an extreme pleasure to work on a project where we can break industry's stigma and create outstanding digital presence.